Maximum shaft strength and low shaft weight. Up to 75% lighter than steel shafts. Up to 50% lighter than aluminum shafts. Minimizes shaft deflection and vibrations. Low inertia offers faster machine speeds. High stiffness to weight relation. Fiberglass, aluminum or steel protective surfaces available. Manufactured to your specifications to suit your equipment. As an alternative to conventional steel and aluminum bodied shafts, Daven offers expanding shafts, support shafts and idlers constructed of lightweight carbon composite suitable for a full line of converting web producing operations. 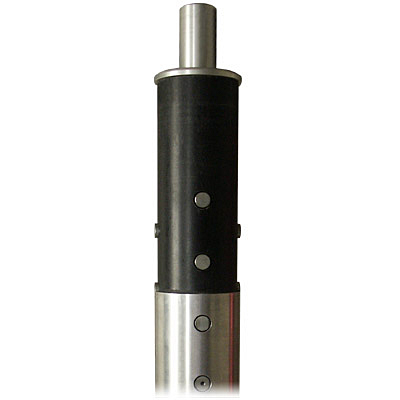 Each shaft and idler is designed and manufactured of the highest quality aerospace composites to provide the right combination of shaft strength, rigidity, and weight for your operations. Its rugged construction and design is available for any diameter or length with particular emphasis on converting applications demanding heavy load carrying capabilities while lightweight for easy handling. An external protective surface of fiberglass, aluminum or steel is available. Shaft weights for your specific applications are available upon request.